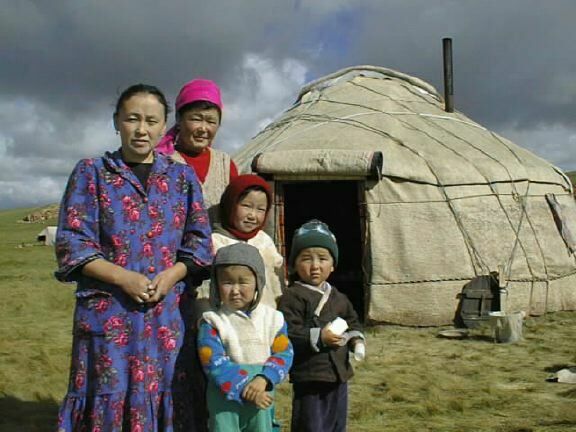 Mongolia is most well known for its yurts, even though they are called ger there - in Ulaanbaatar, capital city of Mongolia, still or again thousands of yurts are pitched and are part of the city itself. 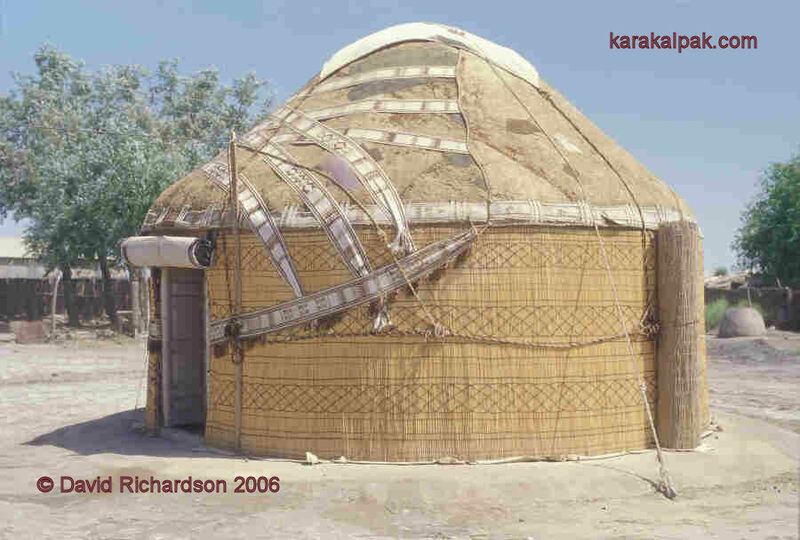 The 2nd photo shows the traditional approach, felt-based insulation, multiple sections (not one piece), dedicated outer rain wall section which reaches the ground (green), multiple ropes stretching over the roof to fasten against strong winds, the roof pipe (and likely the stove positioned in the center of the yurt) reaching through the crown-wheel/toono, which is sealed with glass, part of the top cover folded aside so the pipe goes through. The roof is rather flat, 20-25°; in other words no or very little snow fall expected, the background shows yet some snow. 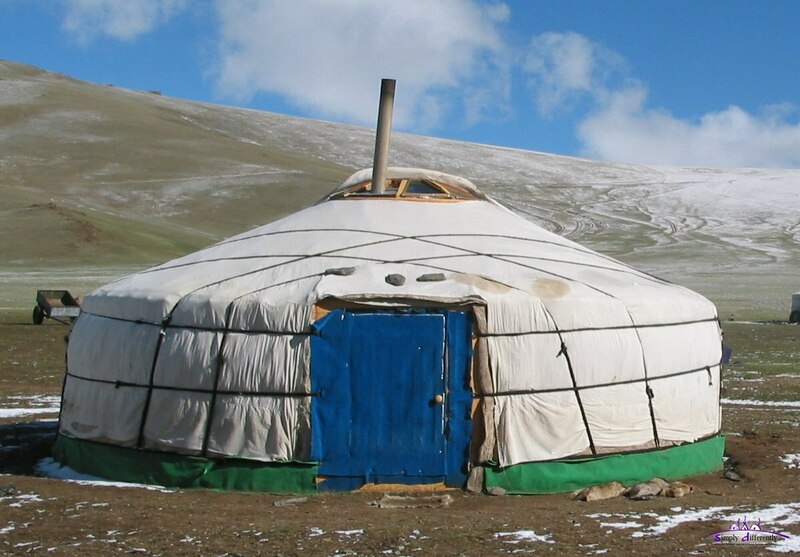 The yurt has a cloth-like felt door, to roll up and down, interestingly the stove pipe goes through the roof on the side and not through the crown-wheel/toono, the wall seems more conic than straight. The cover seems wool felt without the additional white cotton cover. 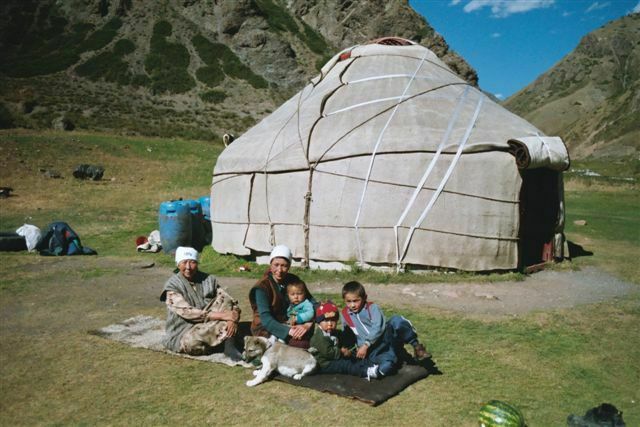 The 2nd photo shows a yurt with very steep roof, likely ~45°, with cotton cover and ribbons to keep the roof parts attached to the yurt. On the first photo you see that the roof cover is made not by one piece, but multiple sheets which have cords attached, to tie to each other. There is no ladder used to put up the rain cover, the steep angle shows (>45°) that snow likely won't stick on the roof. 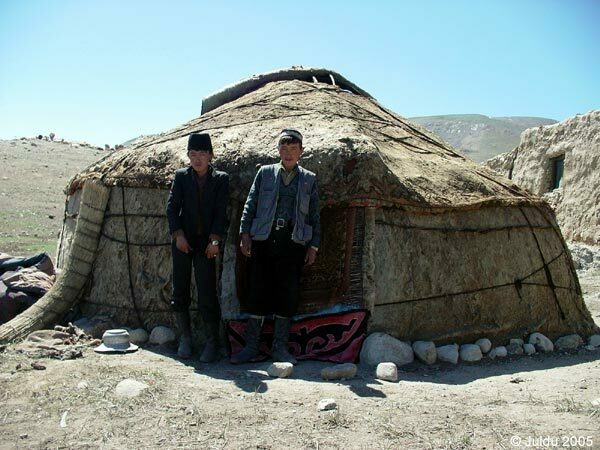 The second photo with the two young men you see the outer layer sealed with stones on the floor - the overall shape of the yurt seems a bit uneven and asymmetric, likely due the roof poles. 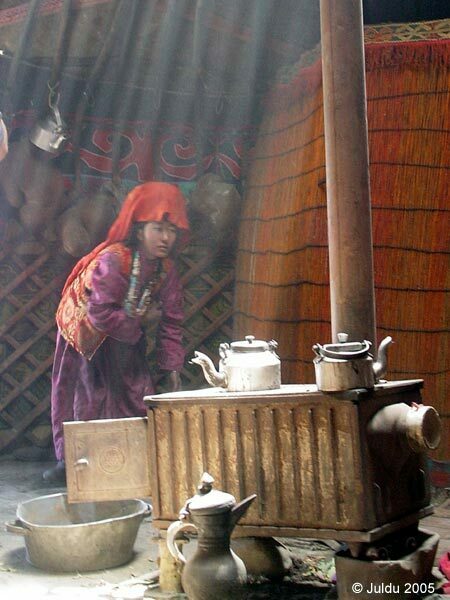 The third photo shows a woman cooking on the central placed stove, the stove pipe reaching through the crown-wheel/toono. The room separating cover seems woven grass. Very steep roof, apprx. 45°, multiple layers of rain cover, ribbons which keep those covers on the roof, as well artistic ribbons. 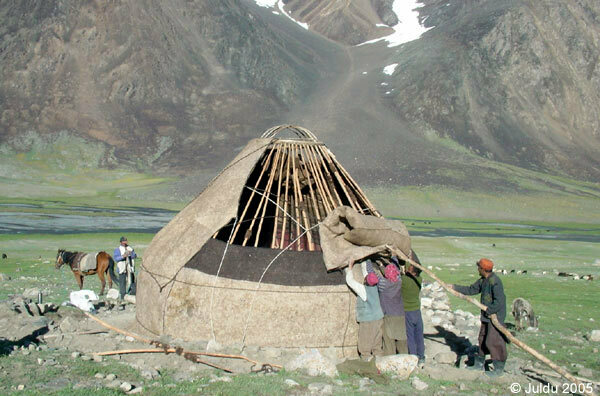 The roof is a rolleable cloth. The router wall cover woven reed, so called shiy, a thin but unflexible rush-like steppe grass also known as chee grass in english. 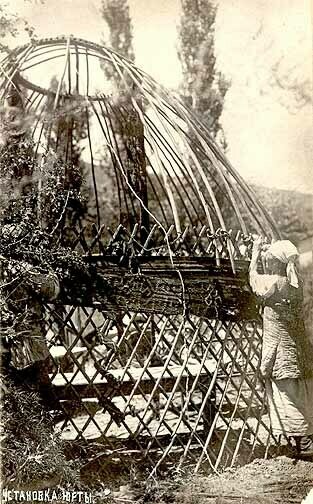 The yurt frame shows that the width of the lattice wall junctions rather narrow, ~ 15 cm, apprx. 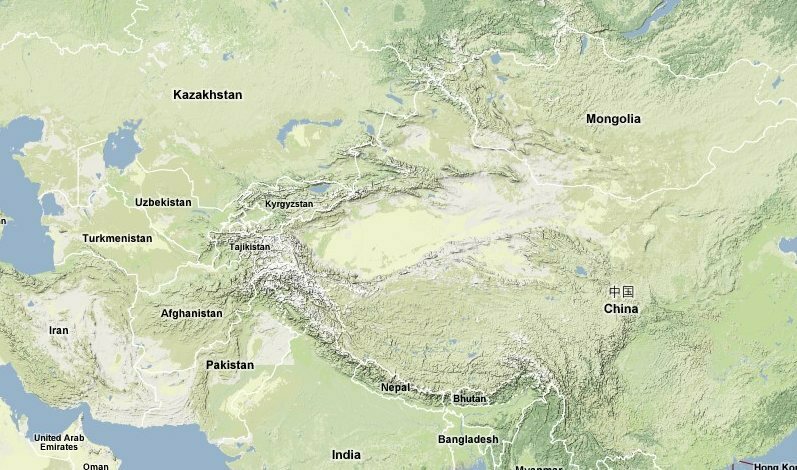 7 roof poles on a 100cm wide door ~ 15cm, whereas every 4th of 21 junctions of the lattice wall is not fixated. 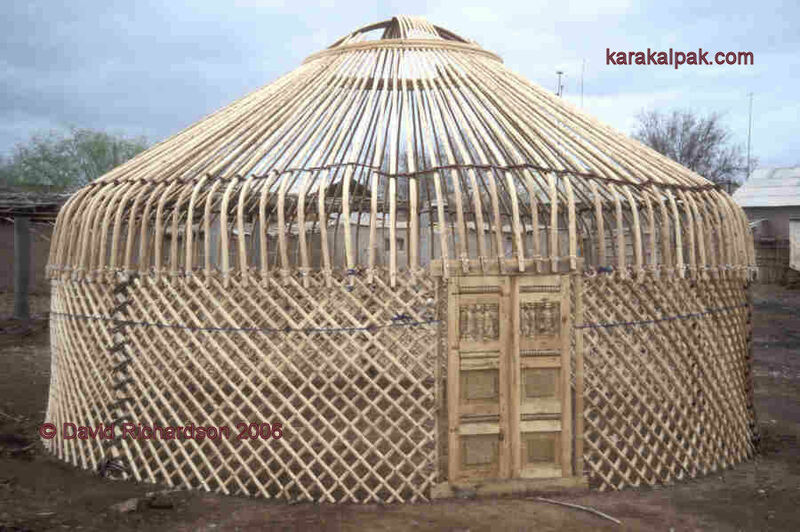 The inner lattice wall lath go from top left to bottom right, whereas kazakh, uzbekh and kirgiz yurts go from bottom left to top right. 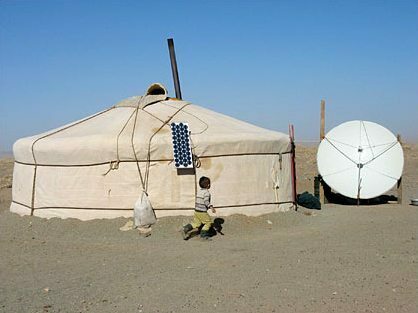 The roof poles are fixated with individual wrap around each roof pole, to separate the roof poles with a given distance. 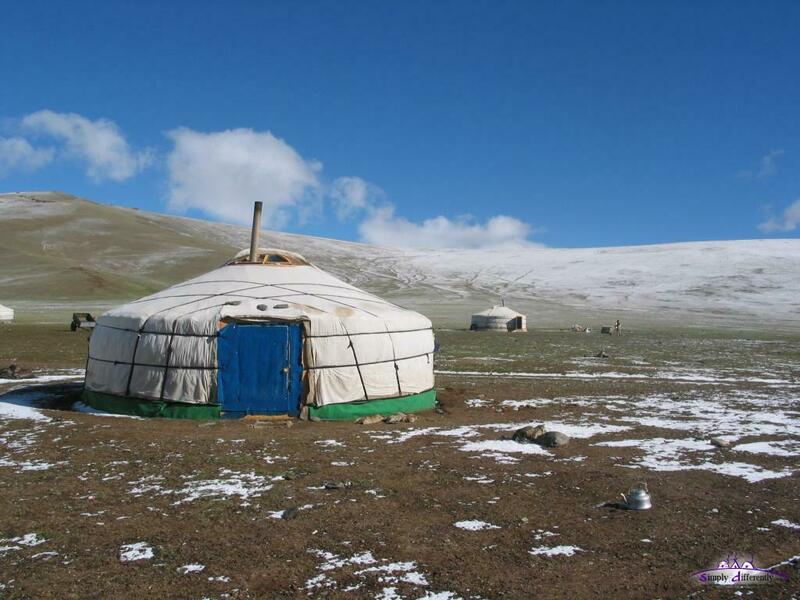 The yurts are generally much heavier as the yurts aren't dislocated once raised , according David Richardson. 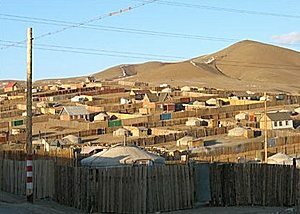 For more information please consider to visit Karakalpak.com .